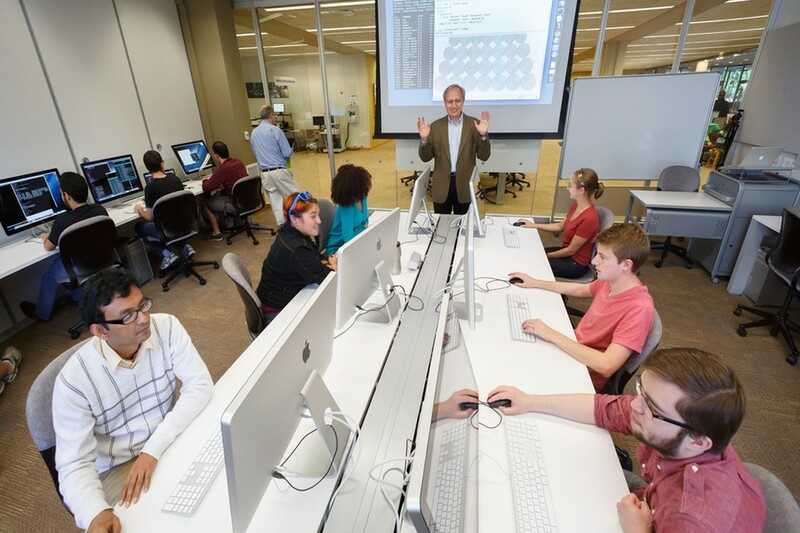 Recent years have seen growing investments in the Department of Computer Science, as new faculty have been hired, new collaborations have been created, and ambitious research centers have been established. Conversations with faculty and administrators in the department reveal that these investments are part of a plan to make the Department of Computer Science “world class” by shifting its traditional emphasis on theoretical computer science to strengthen its programs in data science and systems, and collaborate on computational initiatives with other departments at the University and partner institutions. The origin of the department’s long-standing focus on theoretical computer science lies in its foundation in the 1980s. The Department of Computer Science was started by Robert Soare in 1983, a professor in the Department of Mathematics. Because Soare was a mathematician, there was a strong emphasis on the mathematical and theoretical sides of computer science in the early days of the department, according to John Goldsmith, a professor of computer science and linguistics. In the 1990s and early 2000s, the department made some efforts to diversify its strengths and grow its faculty. Goldsmith said that around this time the lepartment appointed many junior and senior faculty members who specialized in areas outside of theoretical computer science. "So part of the question was what is the smallest size a really world class CS department can be." More recent efforts to grow the department began in 2008, when University alumnus William Eckhardt made a gift to establish the William Eckhardt Distinguished Service Professor Chair in Computer Science. The gift prompted the creation of a committee which included Goldsmith, who was Chairman of the department at the time, and Robert Fefferman, then the dean of the Physical Sciences Division, to figure out what “we should prioritize and define as the most important direction for the department to go if we want to make this a truly world class department,” Goldsmith said. The department modeled its vision for growth on Princeton’s and Harvard’s computer science departments, both highly regarded departments, but relatively small in terms of faculty. “One of the big questions that came up in every meeting was size—the department at that time was around 20 full time faculty, and even the smallest outstanding CS departments were above 30. We took Princeton and Harvard to be our models of outstanding universities that had small computer science departments. So part of the question was what is the smallest size a really world class CS department can be, and the answer that we had was around 30, and we were about 20 at that point,” Goldsmith said. In order to hire excellent faculty, the University needed a leader with administrative ability to attract talent and resources, according to Goldsmith. The department considered using the gift from Eckhardt to do this, but decided to spend a few more years searching. Instead, the gift was used to hire Andrew Chien, previously Vice President of Research at Intel Corporation, and an expert in the branch of computer science called systems. Two years ago, the University made an even bigger effort to make the department top 10 or 15 in the world, according to Goldsmith. Goldsmith stated that a committee was put together and decided to bring Michael Franklin on to be the next Chairman of the department, with the expectation that he would increase hiring and strengthen the department in other areas of computer science, especially data science. The sciences are an important example of a field that will benefit from recent investments in data science. “It used to be that science was focused around experimentation, but now science is also concerned with large scale computations to understand the consequences of theories and explore alternative theories, and increasingly to perform analysis on large amounts of data, whether you are working on environmental science or material science or biology,” said Ian Foster, director of the Computation Institute, a joint initiative between the University and Argonne National Laboratory that advances scientific research through computational methods. Additionally, growth in data science will complement new methods in the social sciences, such as pulling data from non-traditional sources like social networking data or image data from Google Street View, Foster stated. Chien added that data science will be helpful to both the Booth School of Business and UChicago Medicine, as data science can help to analyze and model e-commerce transactions, and help doctors organize and interpret their patient data. "You can’t have a great university without a great computer science department." The recent growth in the department will also bolster initiatives with institutions the University is partnered with, such as the Marine Biological Laboratory, the Computational Institute, and Argonne National Laboratory. According to Ian Foster, director of the Computation Institute, Argonne National Laboratory’s recent project to build next generation supercomputing systems requires advancements in software, computer architecture, systems, and theoretical computer science, and recent faculty hires in those areas over the past few years will help by working on these problems. While many of UChicago’s academic peers already have well established computer science departments, the University has the potential to lead in many subfields, according to Foster. The Department of Computer Science and the Computational Institute will be moving to the second and third floors of Crerar Library in 2018.